I have found a product that I know a lot of folks are going to love! It's called PopATot. It is a portable, collapsible, indoor/outdoor, stationary play station. Of course my little Emily is a bit too small to enjoy this product, as it is recommended for children who are 6 to 18 months of age. But, I am lucky to have a niece and a nephew who just so happen to fit into this category. Since I was meeting up with this past weekend, I grabbed up the PopATot and brought it with me to test it out. The first thing that I noticed about it was how easily it was removed and replaced in the carrying bag. If you've used those portable canvas camping chairs, then you can relate. It is easily transported from one destination to another via this handy carrying bag. I have two nephews that play baseball and soccer, so this will come in handy next year when we go to the games. Emily will be able to keep occupied without having to sit in a stroller or someone's lap! There are several toy loops so that you can hook your child's favorite toys to the PopATot helping to keep them occupied as well as two cup holders perfect for your child's bottle or sippy cup and their favorite snack. My nephew loved it!! He loves to jump. He did a lot of jumping in the PopATot and he really enjoyed it. It is safe and sturdy with the added reinforced safety latches. My niece is petite for her age. She's a teeny tiny little thing, so she had a harder time reaching the bottom. But, it did not make her enjoy it any less. We did put a pillow on the bottom so that she could do a bit more jumping once she could stand. One thing I realized about the PopATot is that it is not just for the outdoors! It is canvas so it's easily washed which makes it perfect for outdoor use but snacktime can be messy, and the canvas material can be easily washed with soap and water. The bottom snaps off for a quick shake to clean out the crumbs. When those infants turn to toddlers, they are not as easily contained as they once were. 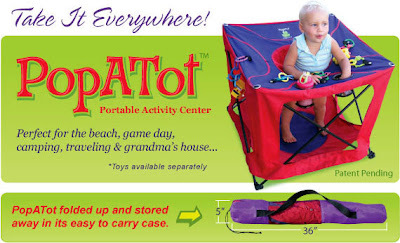 The PopATot is the perfect solution because it's easily moved from one room to another because it is lightweight and collapsible. Those bulky plastic things that you have in your home can be replaced with the PopATot making it easy to cook, clean, or take care of the older siblings while the toddler is entertained! This is something that I love about the PopATot! The greatest thing for me that I noticed in my testing process is that it can stand up to an older sibling. Tyler, my son is head over heals for his neice so I had a hard time keeping her away from him while we were visiting. He kept climbing on the sides and it did NOT tip over during this process. But, it also kept him entertained from underneath. He crawled under her and she thought it was funny because he was under her. He enjoyed making her laugh and thought it was pretty cool that he could hide under there. Overall, I totally love this product and I think that this would be a great product for any home as it is a safe and fun way to keep your child entertained while indoors or out. If you are interested in finding out more information, you can click here and head to their website. While you're there you can read testimonials, check out their photo gallery, read the FAQs, and most importantly, place your order! That really looks cool. What I like is the ground/floor cover, making it much more practical for using outdoors. Popatot - makes me laugh. CallieAnn should get one for B! Yes, Mo she should...did you see that Callie!? I can see where this thing will come in handy on many occasions for me. Those babies sure have grown since the last time I saw them!! How cool is that! I love all things portable and I love the name! What a GREAT product! I wish they'd had this when my kids were little.